We all have fears and anxieties from time to time, but for most people they trouble you today and are gone tomorrow. It’s when these fears and anxieties become persistent that they threaten to derail your life. Your every moment, your every thought is taken up by negative thoughts. You feel overwhelmed and it seems that everything is happening at once. Stanley Popovich is the author of today’s guest post. He is a Penn State graduate who struggled with fear and anxiety for 15 years. He has written a book based on his personal experiences in overcoming his fear, as well as on interviews with a variety of professionals. Everybody deals with anxiety, fears and depression, however some people have a hard time in managing them. Here is a brief list of techniques that a person can use to help manage their most persistent fears and every day anxieties. Stanley Popovich has some good tips to help overcome persistent fears and anxieties. What I like about them is that they are simple, easy to remember, and easy to do. It goes to show you that it doesn’t take a clinical psychologist to make effective suggestions to help others in their lives. Guest posts are a great way to expand the variety of voices and outlooks here on Anxiety, Panic & Health. Each one of us has experiences that would be helpful to others. If you think that you would like to write a guest post, I have a new page entitled “Guidelines for Guest Posts” that covers how to go about it. Click on the link, or look under “Reference & Info” in the rightmost sidebar. Can you share any techniques that you use to set aside fears and anxieties? Have you used any of Popovich’s techniques? Do they work? This was a short post. Would you like to see more of this type post in the future? 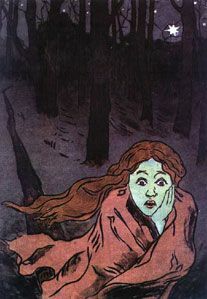 Artwork by Maria Yakunchikova (1870-1902), entitled “Fear,” 1893-95. Very nice tips. I feel compelled to add one though. Remember to take a deep breath! Perhaps the stop sign visualization is also a great reminder to breathe deep, which helps you slow things down. Thanks for your comment, Reid! Yes, deep breathing helps to calm you in so many situations. It is very helpful with significant stress and Anxiety Disorder sufferers. Thanks for the reminder! 1) If you’re not able to breathe or choking, slowing down your breathing, breathing deeply, holding your breath, then slowly blowing it out as if you were blowing out a candle works very well. 2) If you are hyperventilating, breathe deeply and hold your breath as long as you can. This can calm hyperventilation quickly. See the section on “What is the treatment for panic attacks?” in the Panic Attacks reference article. i have bad anxiety and i cant figure out… why me??? it gets better every once in a while but its wierd i will get to where i cant think about anything at all i want it gone if somebody thinks they can help hit up my email…….. I just recently found out that I had anxiety and have had it for awhile. I wish someone had shown me this list a lot earlier. Hopefully I can help someone else.